Sunday September 6th 1925 A frightfully hot day. Ott took me to S S, but he did not stay. The Whetstones brought me home. I sat on the porch most of PM. We went to Whetstones in the evening. Monday September 7th 1925 a trifle cooler. "Labor Day" so no mail. Ott in the country in PM. I to town with Fannie. Was with Birdie and then on up to Whetstones. We were up there again in the evening. The girls fixing things for their parties. Tuesday September 8th 1925 Ott went to Washington Co this morning. There was a hard shower so we went over to Whetstones in a taxi. The party was delightful. We did not come home till after supper. Ott did not get home. I I wrote Winnie Lourence and Mabel McDougal in AM. Hatties wedding day 45 years. 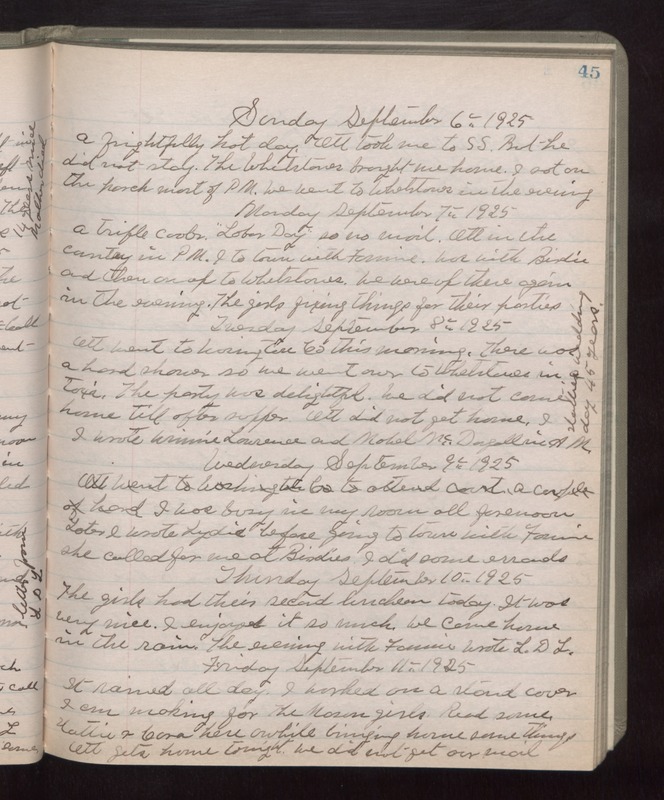 Wednesday September 9th 1925 I was busy in my room all forenoon. Later I wrote Lydia before going to town with Fannie. She called for me at Birdies. I did some errands. Thursday September 10th 1925 The girls had their second luncheon today. It was very nice. I enjoyed it so much. We came home in the rain. The evening with Fannie. Wrote L D L. Friday September 11th 1925 It rained all day. I worked on a stand cover I am making for The Mason girls. Read some. Hattie & Cora here awhile bringing home some thing. Ott gets home tonight. We did not get our mail.